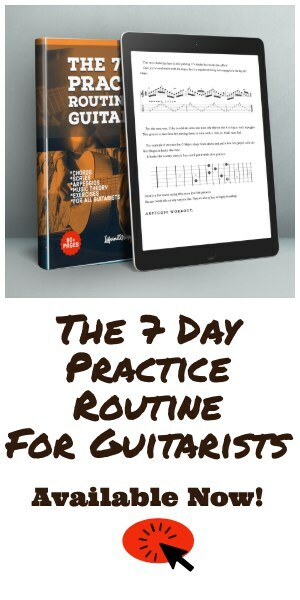 …Definitely check it out as it’s a great place to start before moving to this weeks Tuesday Guitar Practice Routine. Tuesday’s routine is a bit more involved and includes my Modal Workout. 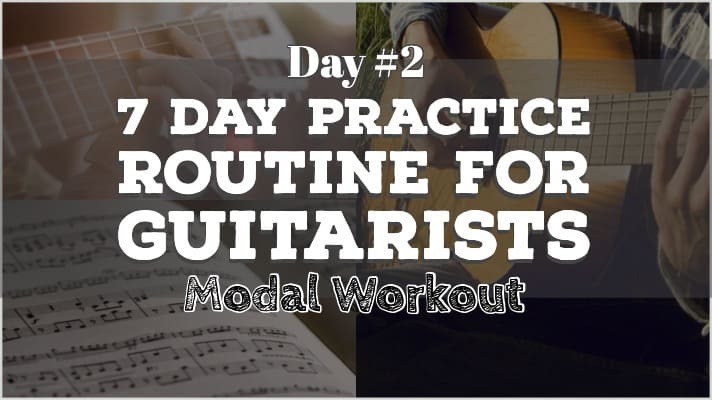 This exercise utilizes each of the 7 Diatonic Modal shapes including alternate picking variations, legato and arpeggios. If you’re new to modes or do not yet have the shapes memorized, hopefully ,this short lesson will take some of the mystery out of it. The easiest (or simplest) way to think of a mode is to just think of each mode as a new scale built on a degree of an existing scale. The first Diatonic mode Ionian, is synonymous with a Major Scale. You could call the above G Major or G Ionian. We now have A Dorian. We didn’t change the notes, we just built a new scale on each subsequent note. A Dorian is not an A Major scale (A B C# D E F# G# A). It is simply a G Major scale starting on the second degree (A). You could think of A Dorian as an A Major Scale with a b3 and b7, or just think of it as the second mode (ii minor) in G Major. How you visualize what a mode is in relation to what you’re using it for will determine whether you think of it as relating to the key of (A) or just a mode of G Major. For example, if I’m playing over a simple A minor chord vamp I could theoretically play any A minor type scale or mode such as A minor Pentatonic, A Dorian, A Phrygian, A Aeolian etc, al. The flip side to that example is… I can also play any OTHER mode in G Major over that same A minor chord vamp. A minor is the ii minor chord in G Major. All of the notes in an A minor chord exist within the G Major scale. For the purposes of this article ,I’m going to use Modal Scales using a “Key Center” approach. This essentially breaks up the guitar neck into 7 Modes per Major Key. All 7 Modes will be in the same Key and played on their respective root notes of each scale degree. When I’m using the “Key Center Approach”, I tend to think of them less as individual modes (with specific sounds and characteristics), and just part of the parent Key of G Major. This is the easiest way to digest modal playing if you’re not already intimately familiar with using modal scales. Using 3 Note-Per-String Modal shapes, you get a nice overlap between each mode which helps visualize where the “good notes” are when improvising or writing a song or solo. Ionian overlaps Dorian. Dorian overlaps Phrygian and so on. A good way to use this overlap visualization is to improvise over a backing track using only 1 or 2 adjacent modes such as G Ionian and A Dorian. when this becomes comfortable, move on to the next pair. Let’s move on to the workout! Regular – Ascending and descending using alternate picking. 4’s – 1234, 2345, 3456, 4567 etc. Up & Back – A variation that exploits the difficulty of the upstroke on adjacent strings. 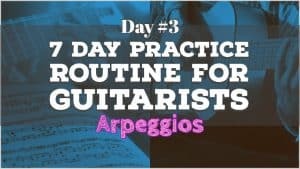 Arpeggios- Yes! There are diatonic arpeggios hidden in each modal shape. 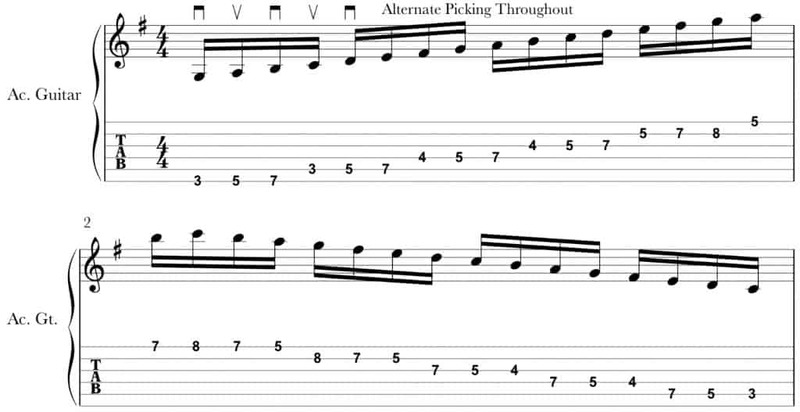 Legato – Hammer-on and pull-off variations best suited for electric guitarists. UPDATE: The Full Book is Done! Read the reviews here. Memorize all the sequences in Ionian until they are comfortable and can be played without mistakes (and without stopping). Take a break after every 1-2 modes. If it hurts, STOP. Never play through pain. Always use a metronome! If you don’t have one, they’re cheap. Grab one on Amazon or at your local music shop. Allocate enough time to do the workout in all 7 modes. At 100 BPM the entire workout takes about 40 minutes. Always alternate your pick strokes. Keep an eye on that right hand. Practice slow at first. Never practice faster than you can play perfectly. Straight alternate picking ascending and descending. I like to do this 4-10 times to warm up before moving into the 3rds sequence. Go right into the “3rds” and “4’s” sequences without stopping. In fact, you’re going to continue into each sequence without stopping or changing your alternate picking. Always alternate pick throughout the workout. Always. 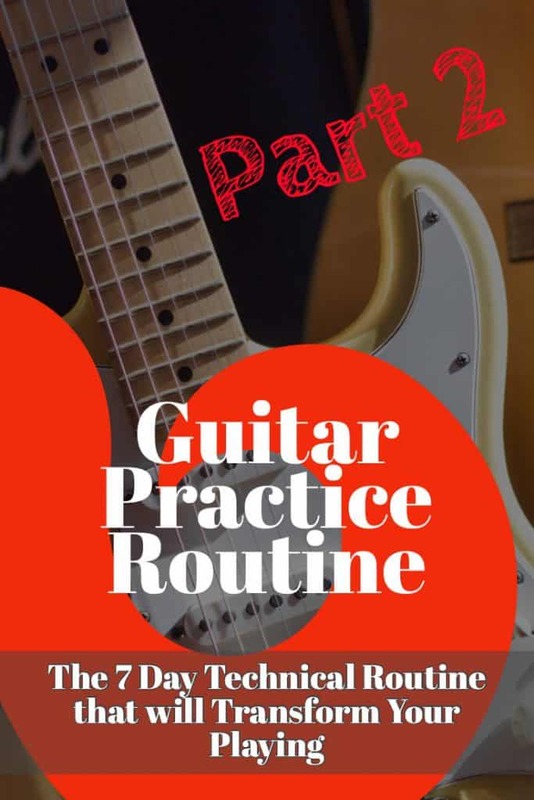 The “Up & Back” sequence is a variation on an old Paul Gilbert exercise he used to teach at G.I.T. in the 1980’s. The funny thing is… he got it from Al Di Meola who had done this exact sequence as far back as 1975. You can hear a pristinely executed example of this on the live album Friday Night in San Francisco track Mediterranean Sundance/Rio Ancho. A Must own for any guitarist. Regardless of who did it first, it’s a wonderful exercise that focuses on the difficult “outside picking” problem. When you pick on a downstroke on one string, and an upstroke on the next higher adjacent string, it’s called Outside Picking. There are a lot of ways you can do the “Up & Back”. Feel free to experiment and tweak it to help any deficiencies in your picking technique. Even if you’ve been blazing these modes for years, you may not have noticed the hidden arpeggios in each shape. Each modal shape contains diatonic 7th arpeggios that can be used for a variety of improvising applications. These arpeggios will give your solos a more focused and sophisticated sound. They also make for an excellent picking workout that involves some string skipping. It’s also a beautiful thing when you can make a scale not sound like a scale. This sequence is wonderful for that. These arpeggios are hidden in all of the 7 modal shapes. MIND BLOWN! As with the rest of the sequences, I sometimes will tweak this to include extra repeats. That one is probably my favorite sequence and a lot of fun! The last part of the Modal Workout should be pretty self-explanatory. We’re going to give the left hand a little love on this one. You could do this sequence on the acoustic guitar but it’s much better suited for electric playing styles. Legato Defined: In a smooth flowing manner, without breaks. Starting on a downstroke you’ll then slur (hammer-on) each subsequent scale tone with the left hand on the low E string. When moving to the A string you’ll use an upstroke and repeat. Always alternate your picking strokes! No breaks between notes. Legato should be one continuously flowing line of notes. 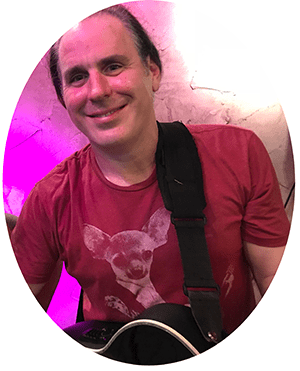 Don’t forget to get on my bi-weekly mailing list that includes access to my FREE Guitar Printables library, discounts on my upcoming Instructional Books and website updates. If you have any questions I’d be happy to help. Thanks Bayu, I appreciate that and will continue to write more articles. Wow, thanks Jason I appreciate that. Great exercise! Do you think there’s any disadvantage to using directional picking instead of alternate? Love your site, btw! Directional meaning “economy”? I don’t think theres a disadvantage. Its personal preference for sure. I will say alternate picking is a more versatile tool for more different things and in my opinion results in a better pick attack and tone. Economy picking certainly can allow you to play some things faster… but I think alternate picking is a better overall tool.